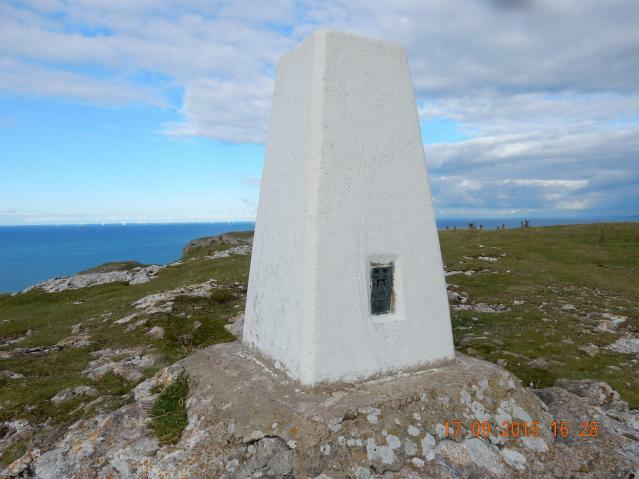 There are 101 photos for this trigpoint (view album). 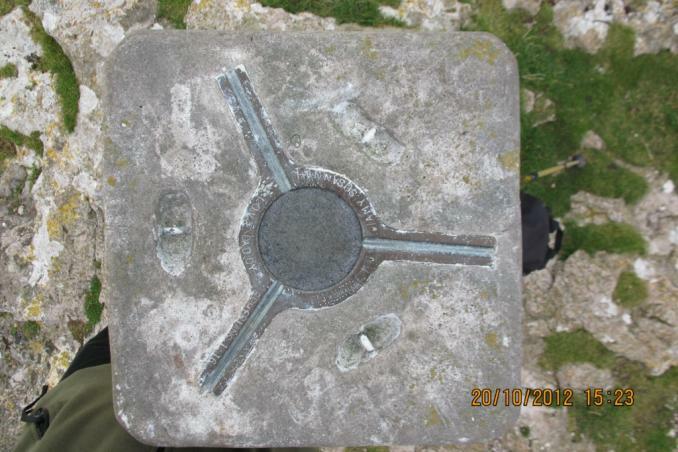 Is ranked joint 294th with 5 other trigs (more). See 93 more in the album. parked at the premier inn,paths everywhere to the pillar,superb. 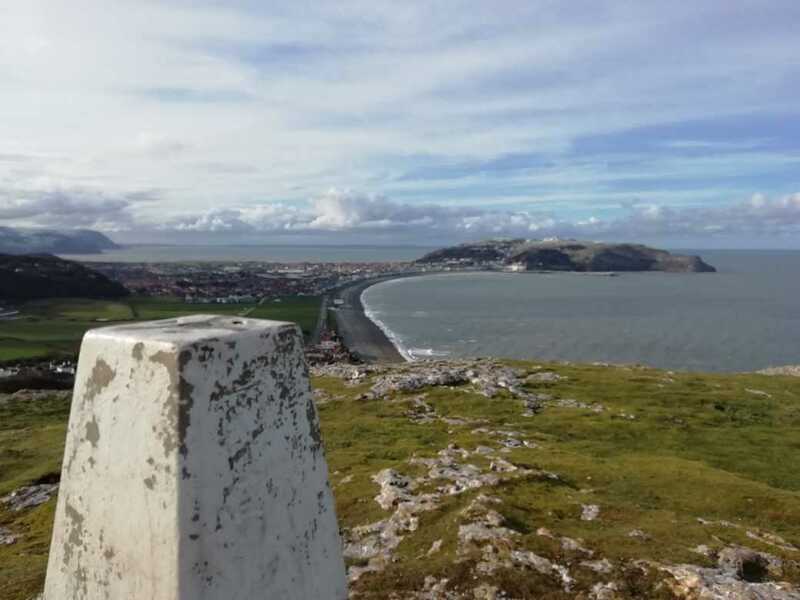 Great spot looking over Llandudno to Great Orme and across to Snowdonia. 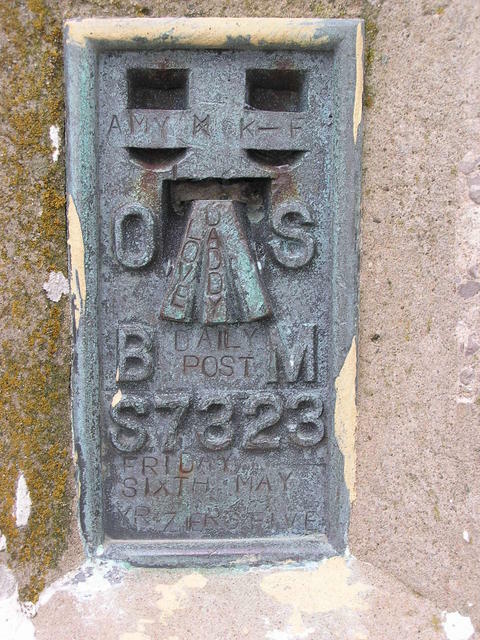 Pillar in good condition with replacement plug. Parked in Premier Inn across road from start of path into nature reserve. 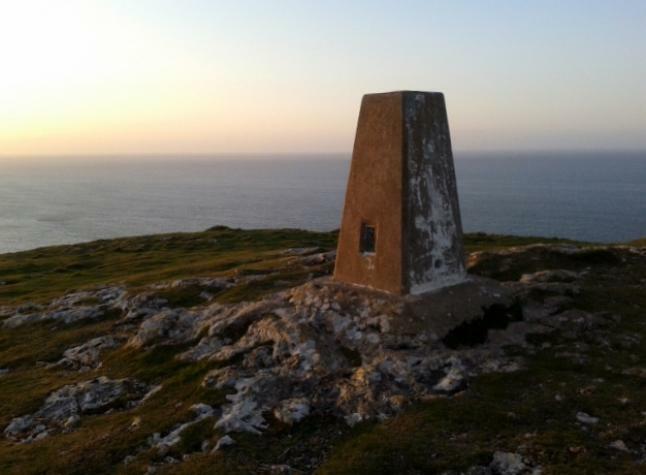 Nice walk around headland. 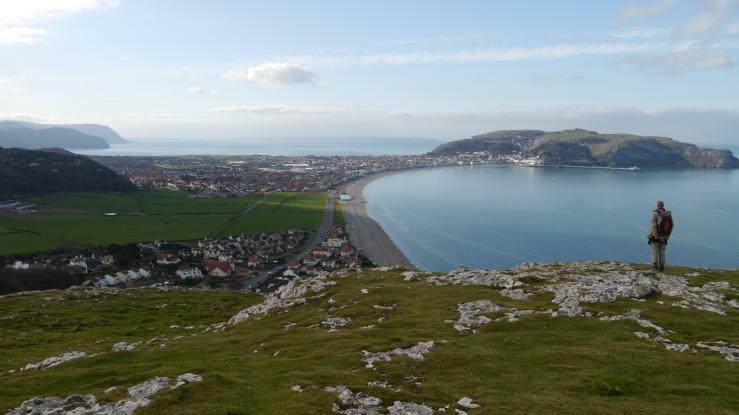 Great views over llandudno beach and along the coast. 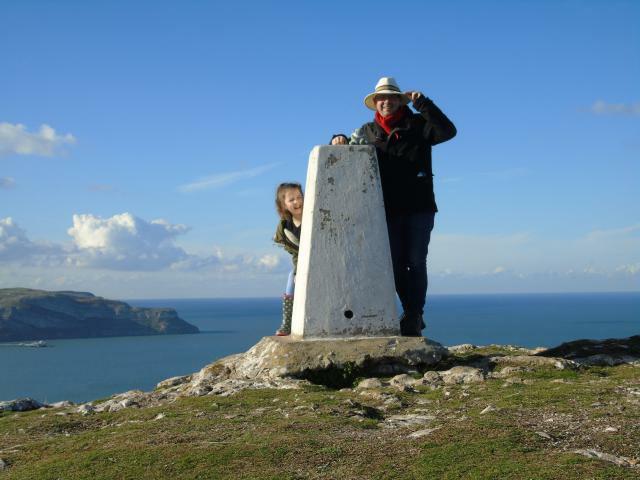 Sunny day over Little Ormes Beautiful views along the coast from the top of Little Ormes Head today. 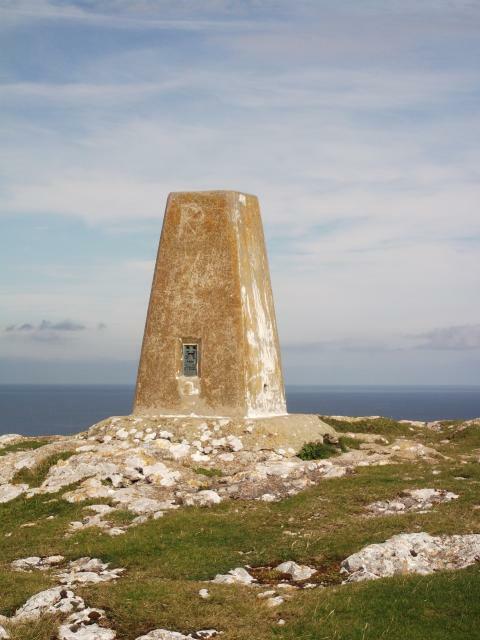 Little Ormes Head The trigpoint. One sight hole open to ESE. 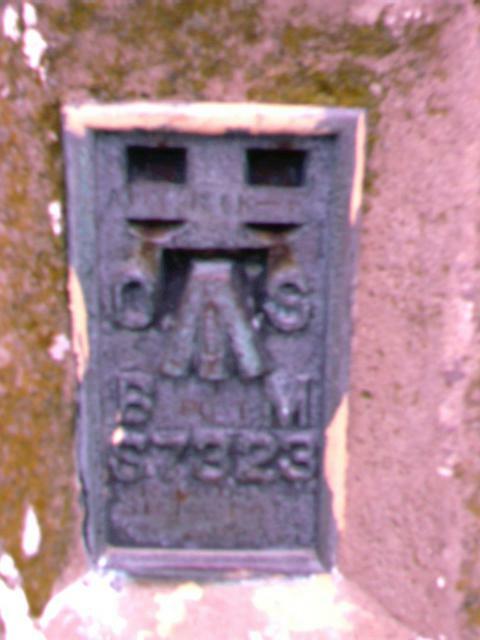 Little Ormes Head The FB, faces SSW. 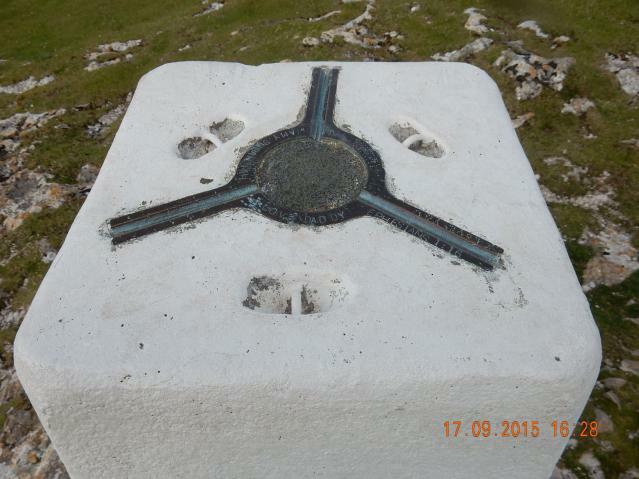 Little Ormes Head Top of trig, bitumen cap. Amazing views. 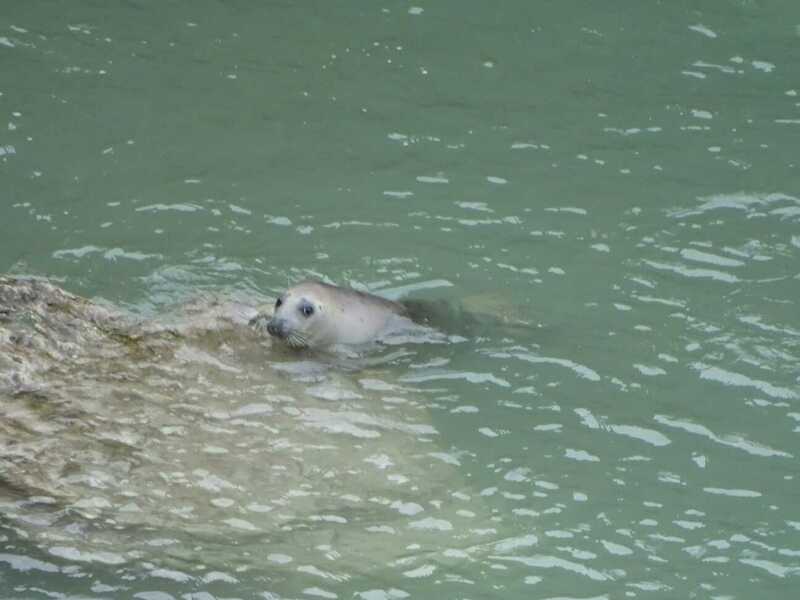 Walked up to trig and onto Angel bay to see the Atlantic grey seals. 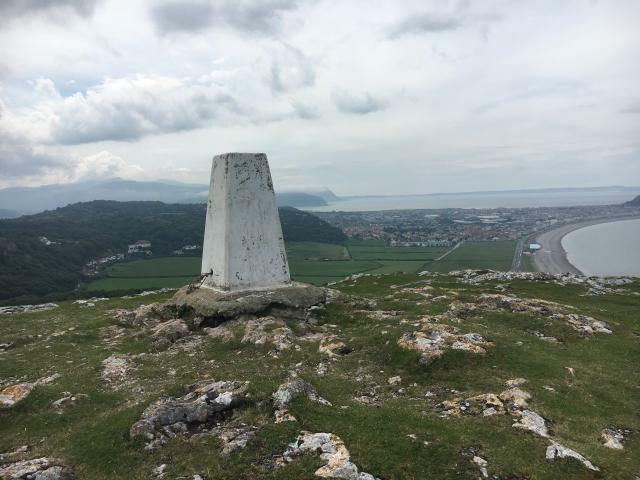 Little detour whilst walking the North Wale path from Llandudno to Llanddulas. 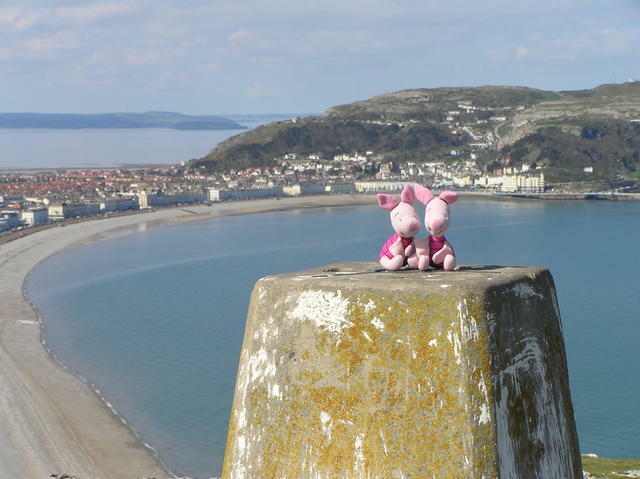 Great view of the North Wales coast from up here. 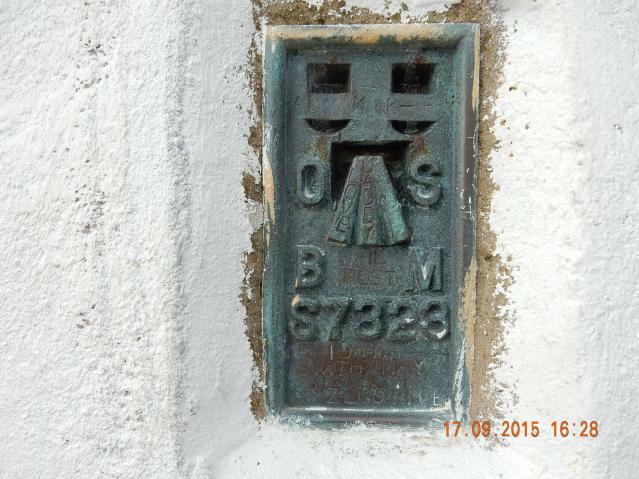 Easy access on Wildlife Trust land. 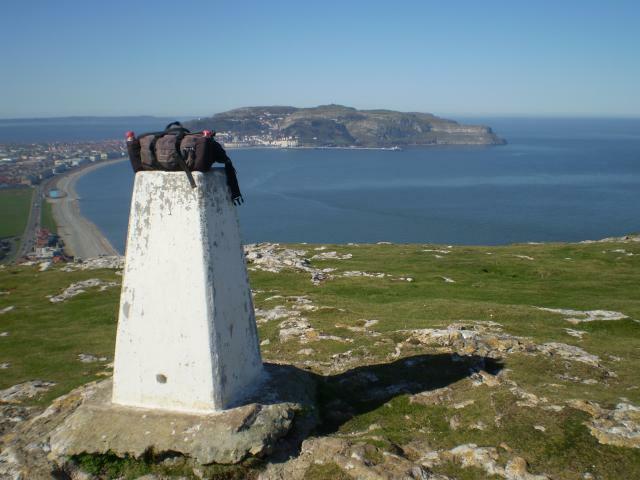 More great views and much quieter than its neighbour on Great Orme. Super up here with no tourists or buildings nearby. 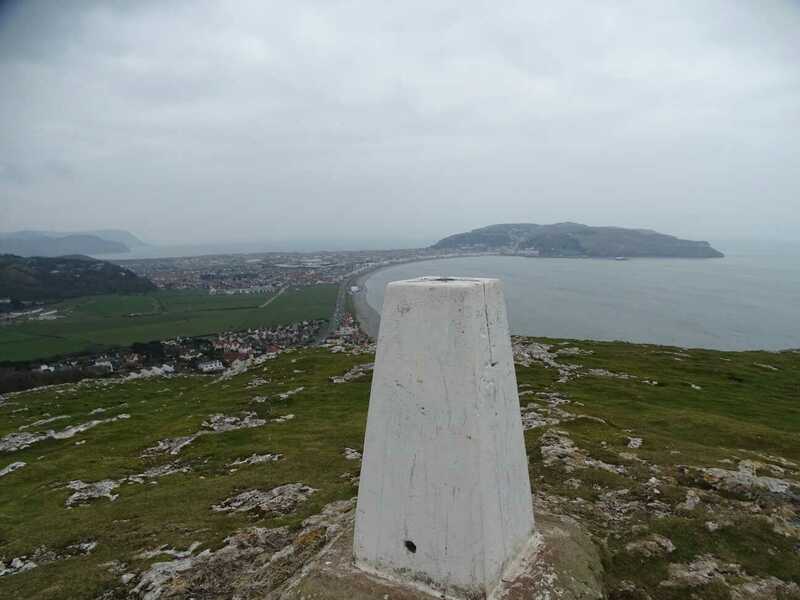 walked from llandudno along promanade,past premier in,then footpath on left,followed path up then bit of a scramble to top(may have taken wrong turn)trig point looks good,we had good views all around despite overcast sky.continued over top to quarry and got a nearby geocache whilst watching seals in bay. Walked along the prom. It was further than it looked. Superb situation with great views. A kestrel and some alpine chuffs kept us company. 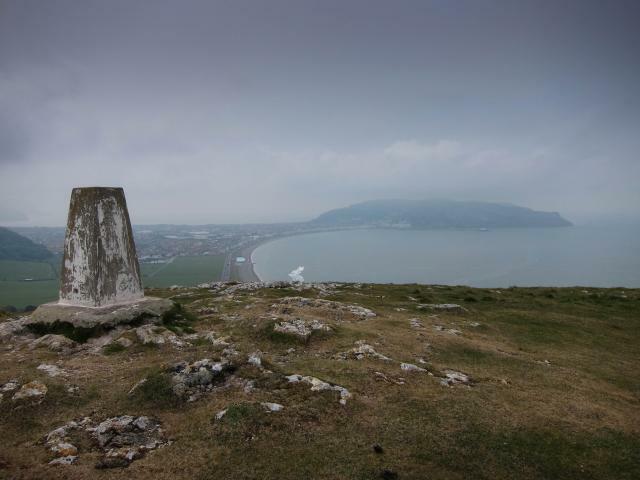 Unlike the Great Orme, there was nobody else around. Quick dash up from a parking spot on Bodafon Rd, apparently Premier Inn car park is usual place folks park for a quick up and down; would have been better to allow more time, especially if weather fine, as it was today. Lovely panoramic views. 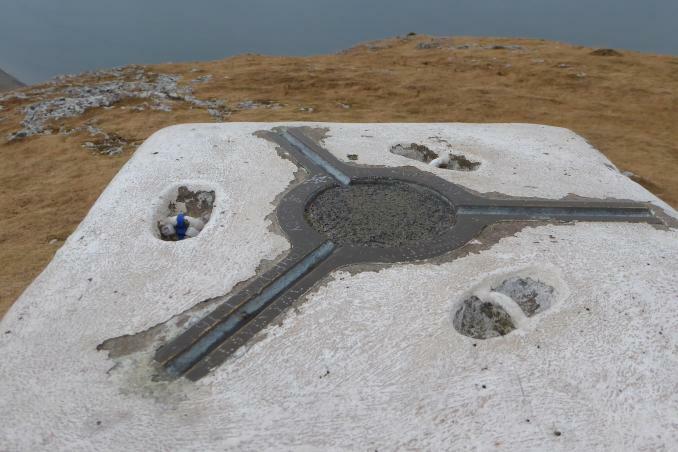 Pillar sits on concrete plinth and has reasonably fresh coat of white paint. Cap missing, asphalt plug; RHD side sight hole open. Pillar in excellent condition and obviously well loved by someone. Great views along the coast. 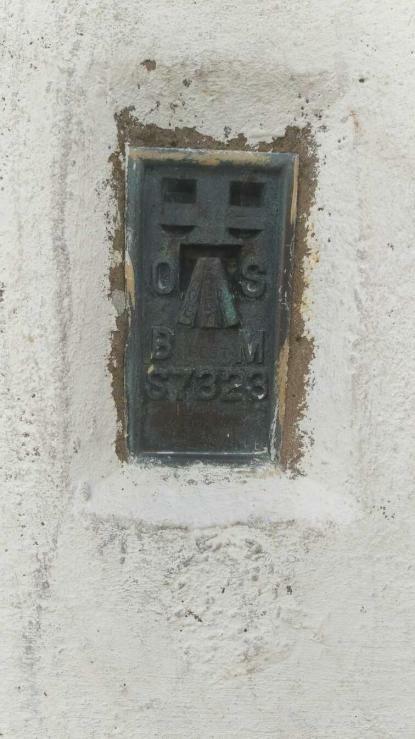 Been to the town many times over the years but never to this spot. Asphalt cap. Painted white. Superb sunny evening. Wonderful view. 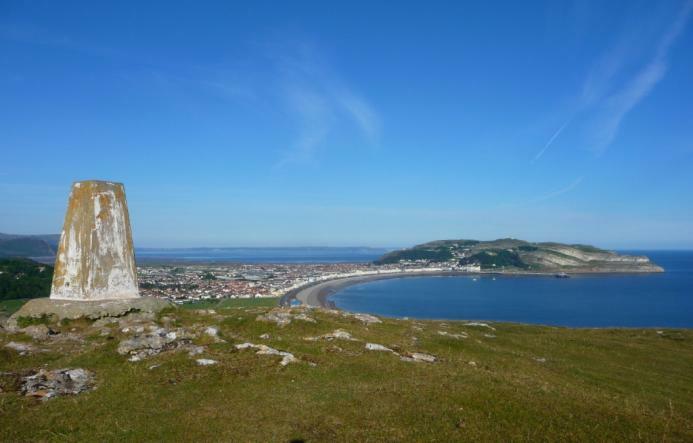 Walked along the Prom from the Great Orme & up through gate at side of the main road. 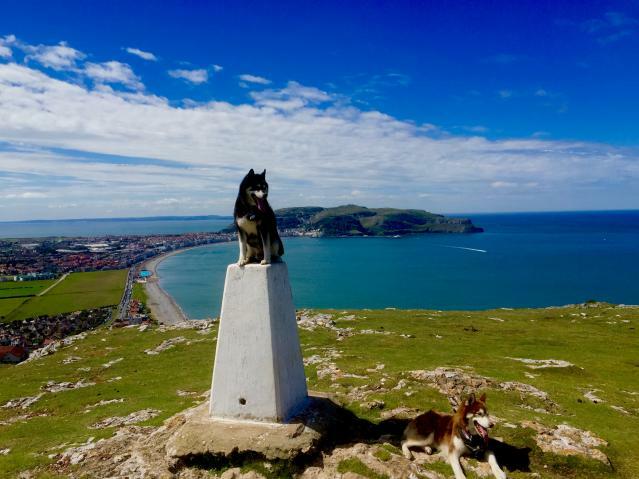 Stunning location giving a perfect view of the Great Orme. 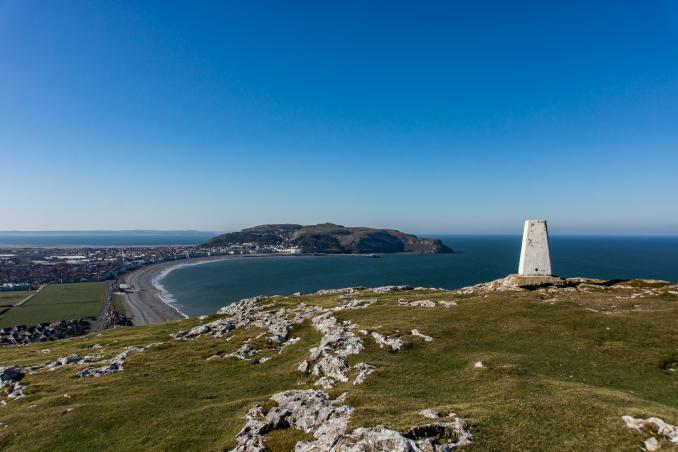 I walked up from Llandudno after arriving via day excursion from Earby with Moving People Coaches.Great weather Fantastic 360 views. �58 return by train �18 by coach bargain. 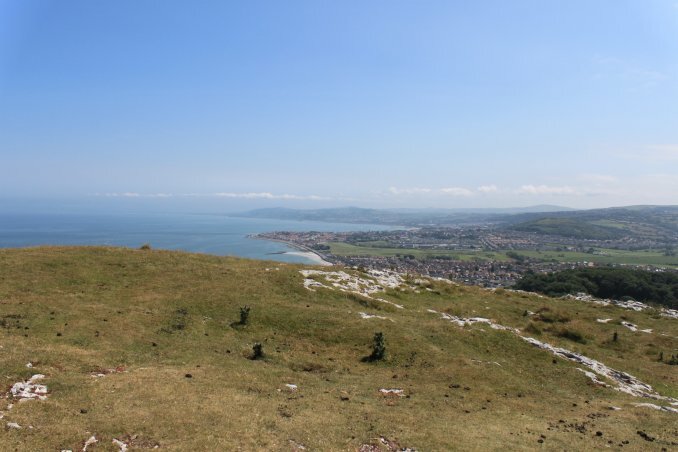 Panoramic looking towards Bae Colwyn. 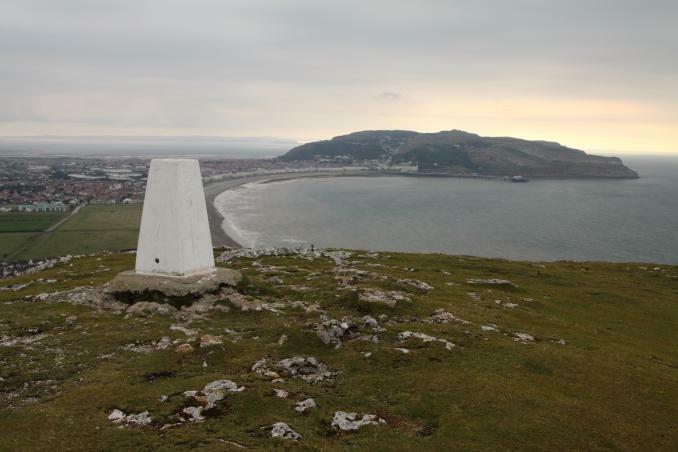 Panoramic looking towards Great Orme. 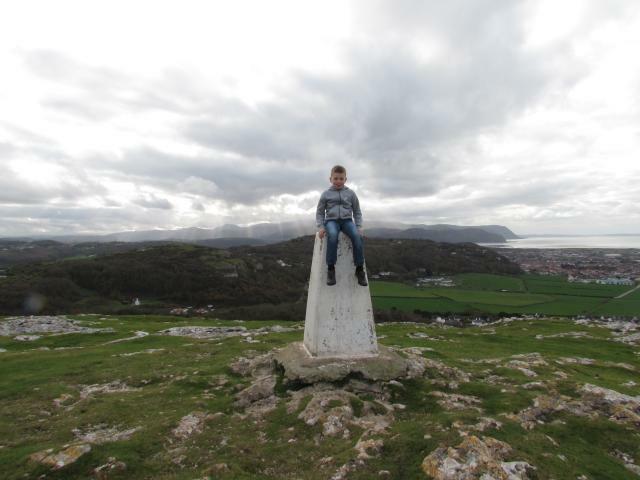 Parked near to "Croeso i Cymru" geocache and walked to the start of the PF. Then it was up and up in the late afternoon sun. 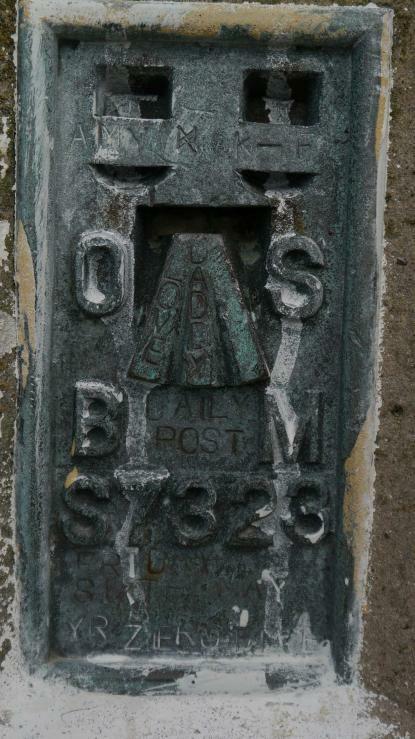 As already noted, the plate has been stamped with letter punches. 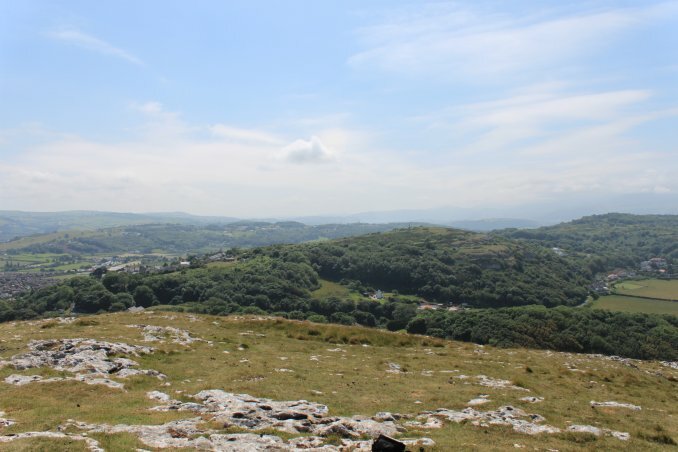 Views were simply bendigedig. 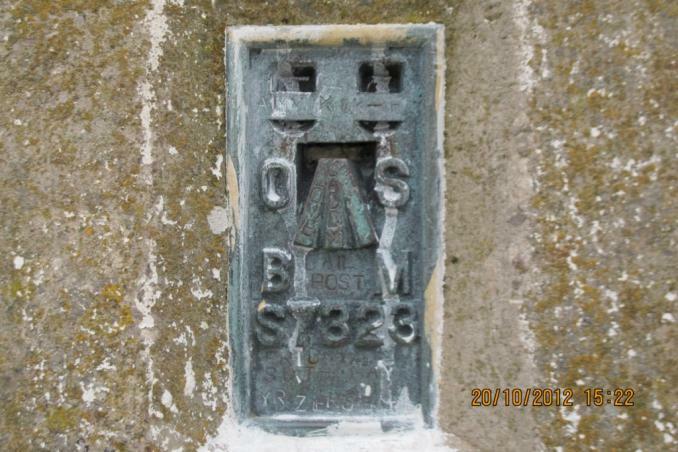 Great views and nice little walk up to this one views at this time of day were special.Trig in vgc tarmac plug metalwork has punched writing on it. 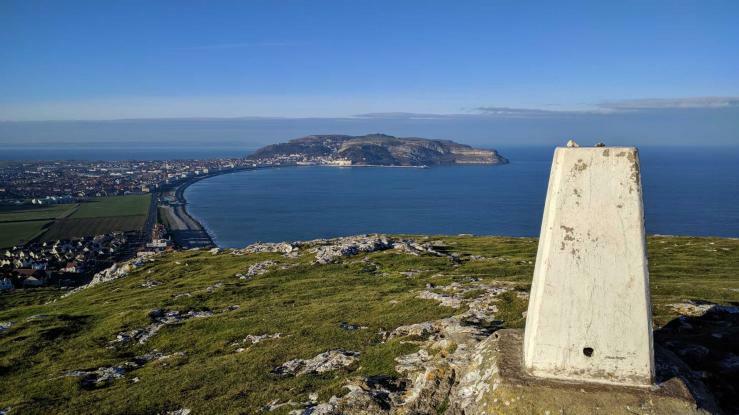 Had visited Llandudno many times and was always curious about the Little Orme so now that I've started trig bagging that was even more incentive to check it out - lovely to see a different view across the town. 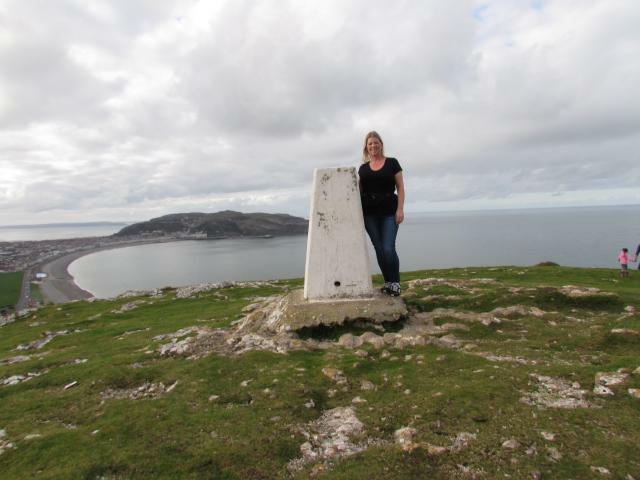 Did this on day out to llandudno. As others up from Premier Inn. 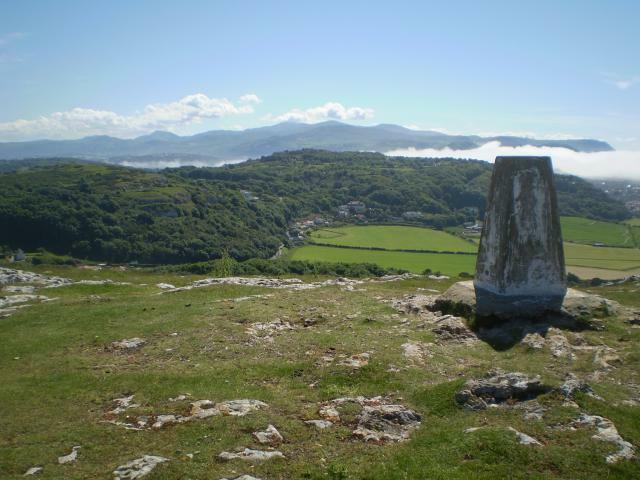 Cloud over Snowdonia but still excellent views. 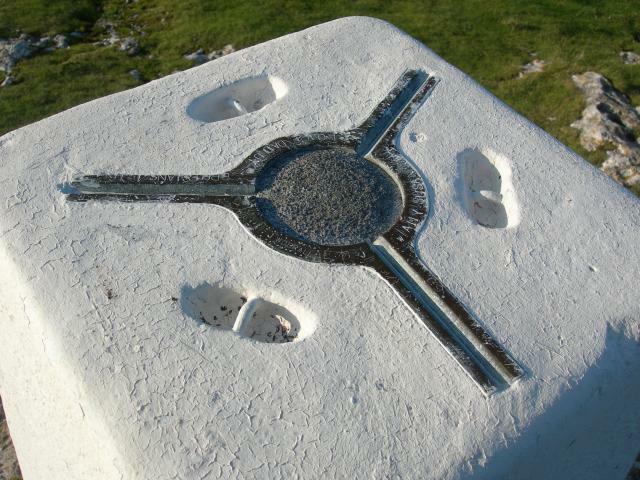 Spider centre with asphalt plug. I was a bit cheeky here and left my car in the Premier Inn car park at N53� 19.388� W003� 47.150� but I did enjoy a cup of good coffee there when I returned. 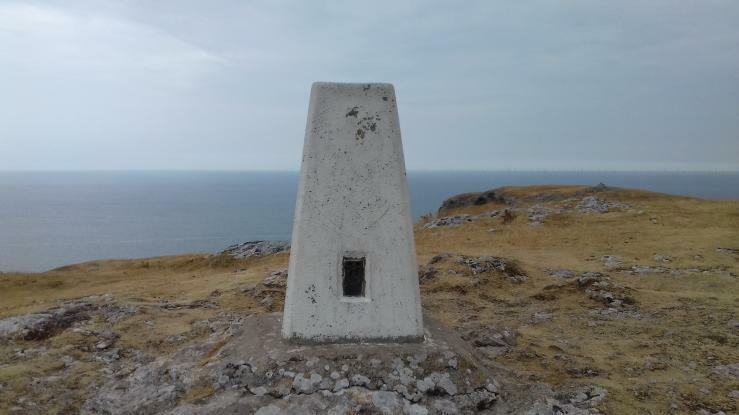 I walked a 100 yards or so up the road to the start of the footpath, then followed the path as far as the kissing gate before striking off up the hill, following the animal trails. 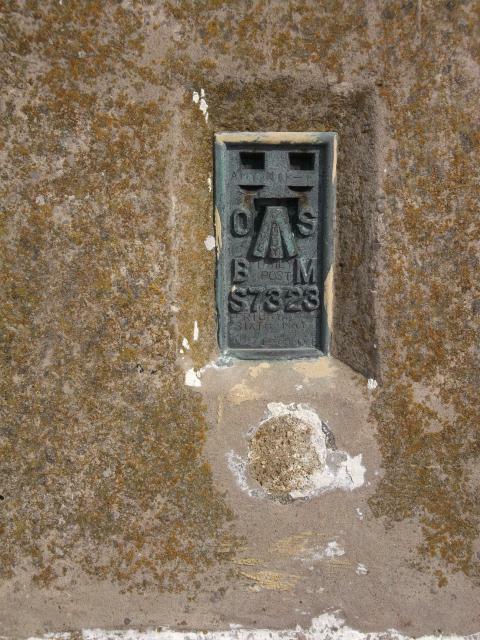 The pillar is in generally good condition but the plug has been replaced with an asphalt filler. 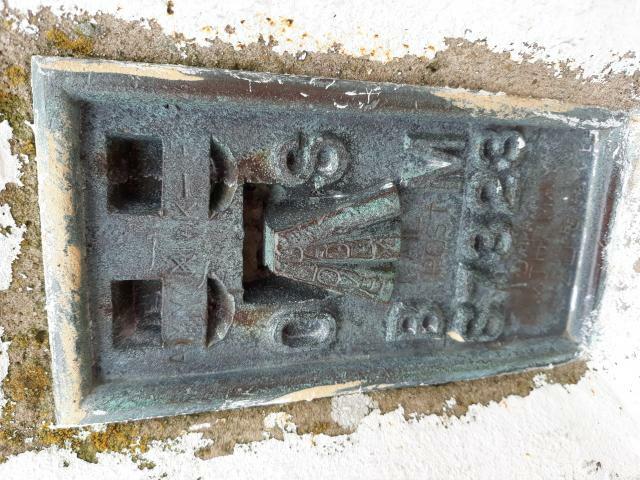 Someone has �attacked� both the spider and the flush bracket with a hammer and a set of letter punches, leaving strange messages in the metalwork. I suppose that�s marginally better than attacking it with a hammer and cold chisel. 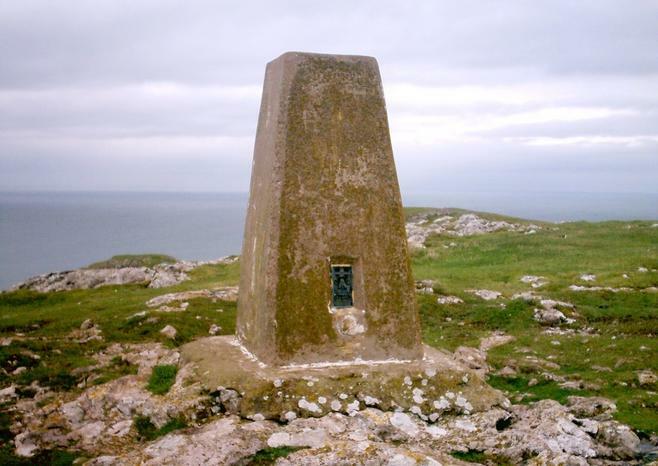 The views are probably better than those at the nearby Great Ormes Head pillar. 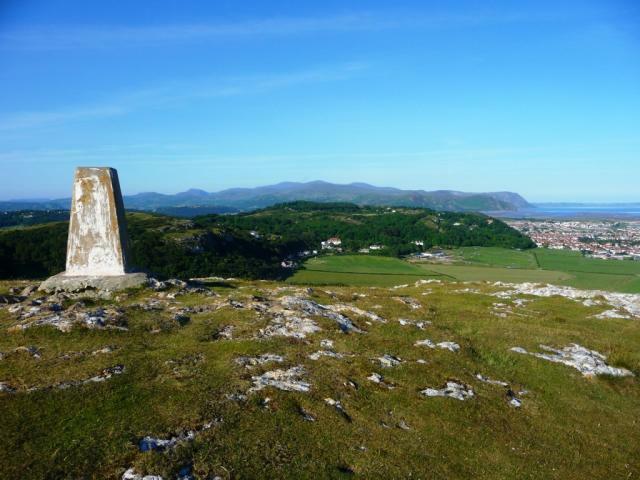 Beautiful clear day, outstanding views of Snowdonia and Anglessey. 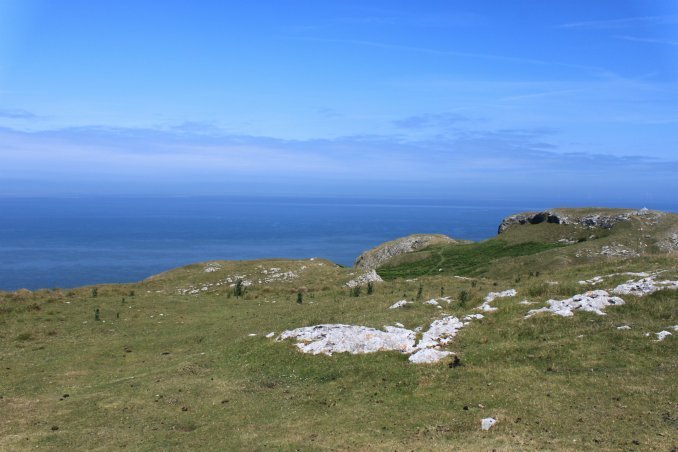 Abundant bird life including Fulmar (one seen), Ravens, Meadow Pipit, Chaffinch etc. 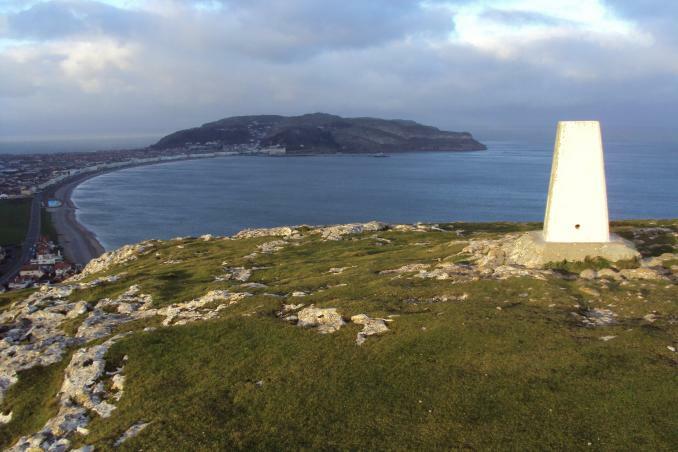 Agree with previous visitors much better views than the Great Orme. Parked in the Premier Inn car park and had a coffee their after. easy walk from the pub on main road,great views. 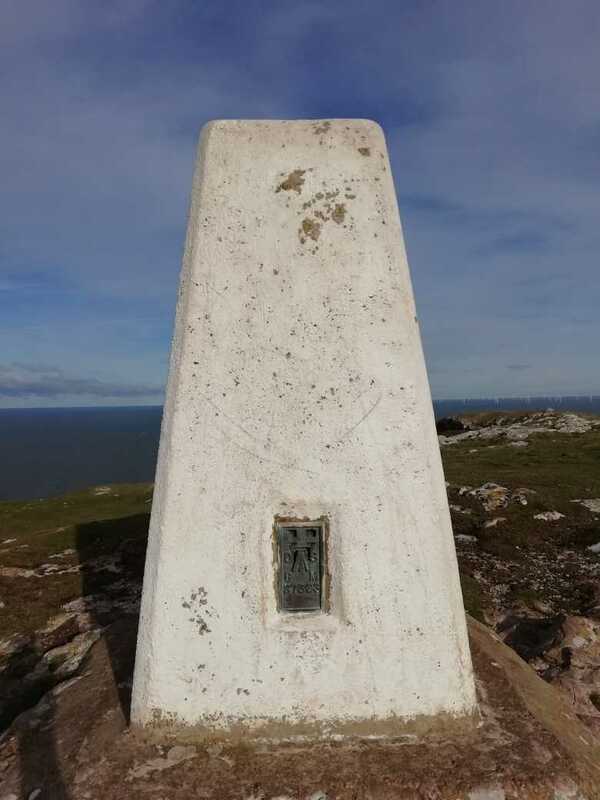 Drove through housing estate, parked in Morta Road, up the steps and followed a path to the summit.The views were, if possible better than Great Ormes Head.Two successive tens, it doesn;t get better than this. 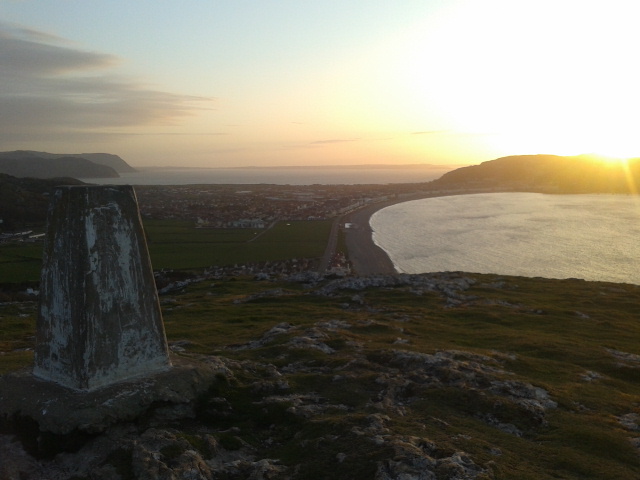 Staying in Llandudno after doing the Snowdon Horseshoe yesterday. 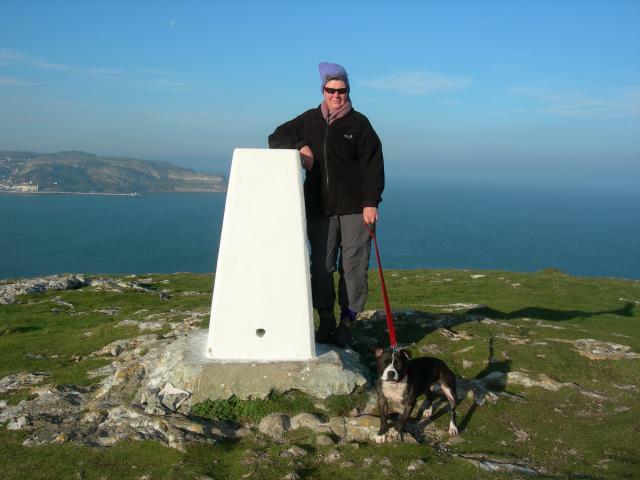 Up early for the walk to the trigpoint before breakfast. Great morning with blue skies and no wind. Agree with redDragon much better than Great Ormes Head. 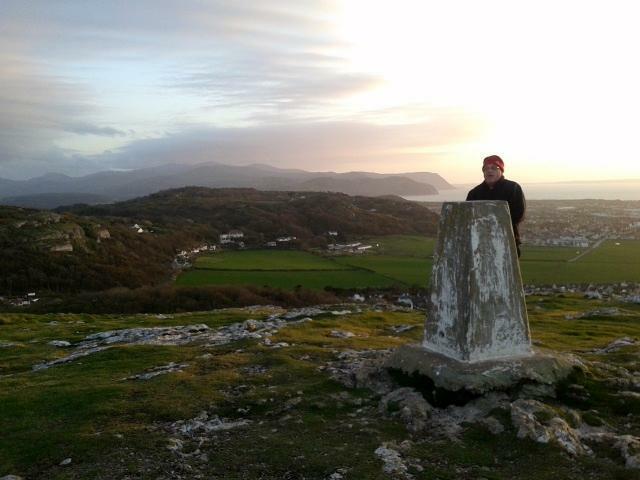 Lovely views back to Snowdonia and into the bay. 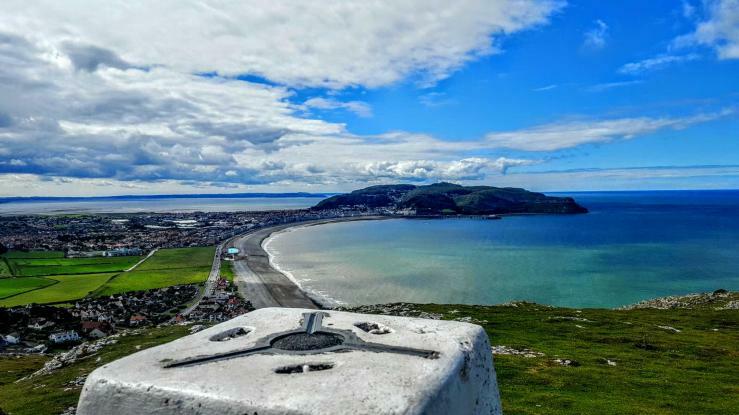 Llandudno council should be complimented on their efforts to invigorate the town everything looks very smart and litter and graffiti free. Just a pity that it�s not got more visitors � hope things improve. 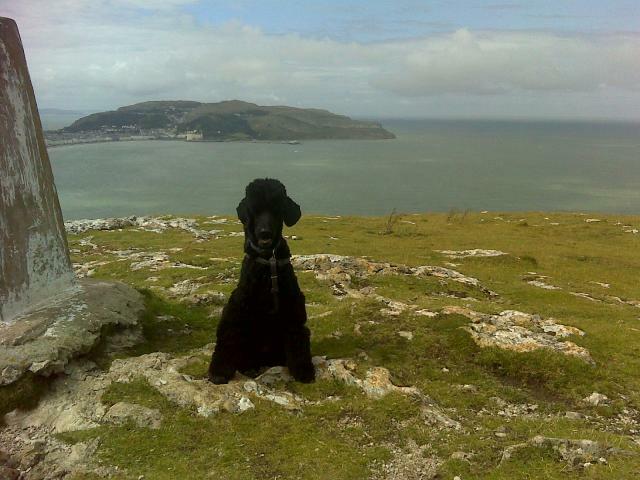 I prefered here to the Great Orme, which I was on earlier. Its quieter and the views are probably better. 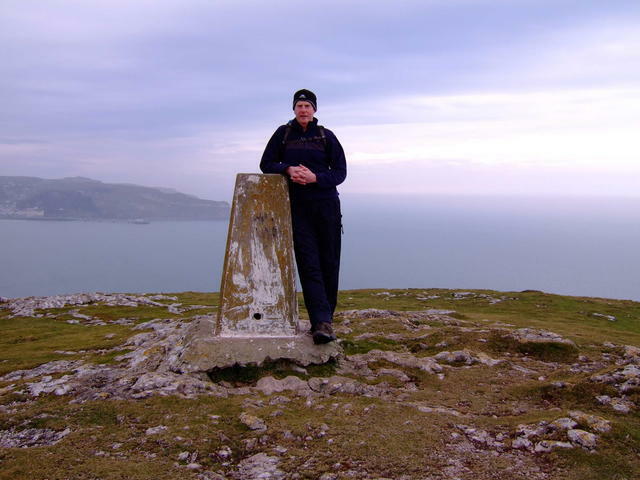 I started on the footpath from the road, but climbed straight up along the ridge. Not too steep. 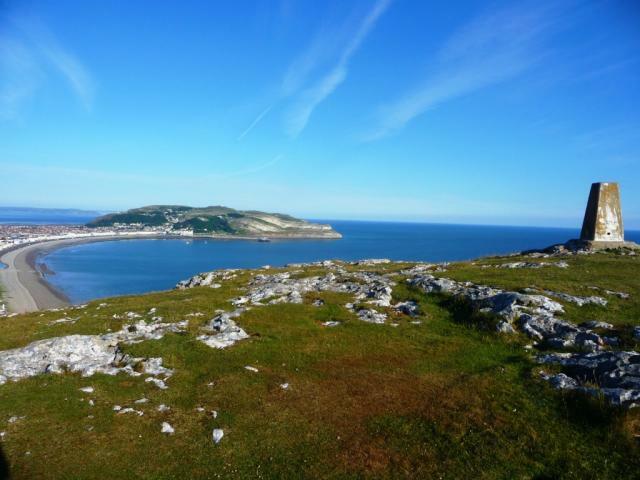 Fabulous view of Llandudno Bay and Great Orme, Snowdonia a little lost in a heat haze. Would score higher on a clearer day. NCOF! Did not have time to go up to trig. Clearly visible from the road. Will visit again. 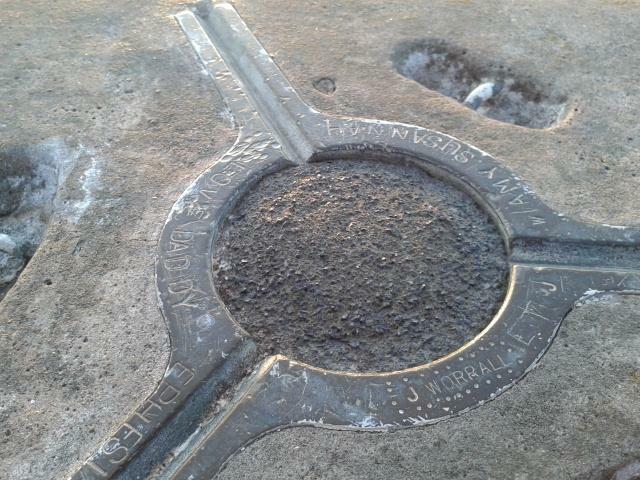 I�ve been up here many times before and as usual this day was not a disappointment. 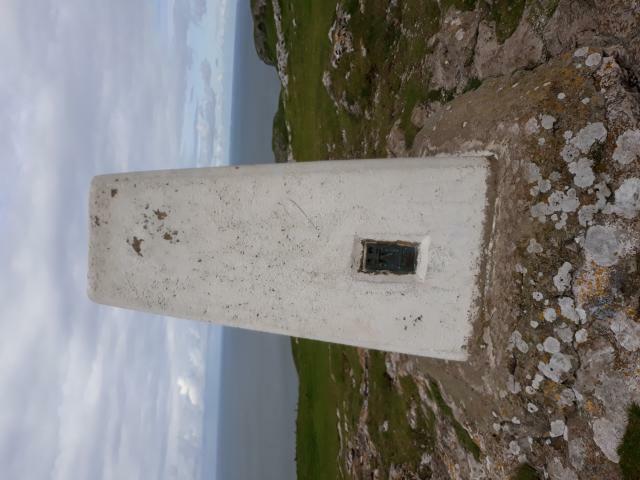 I�d already been up to Bryn Euryn trig pillar and had rushed around Bryn Pydew and Penrhynside to get here. 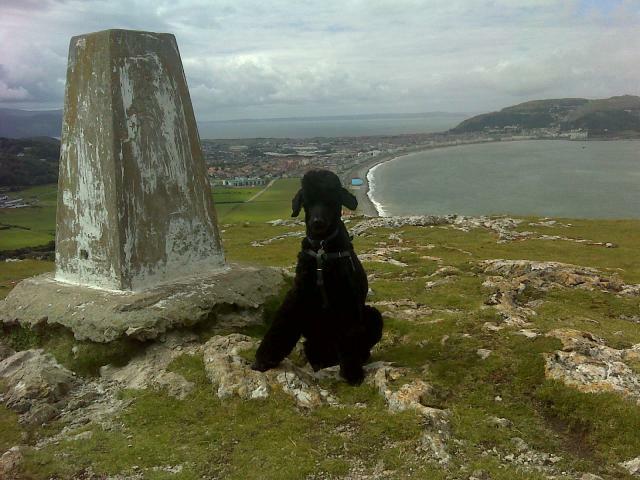 The top was nice and quiet so I was able to enjoy the views of the North Wales coast in peace. 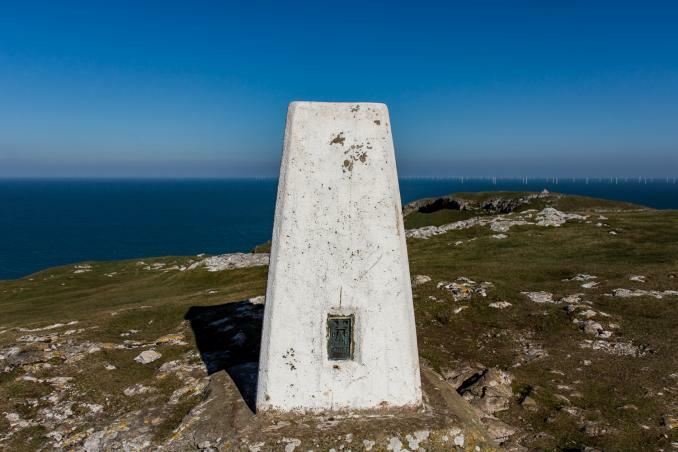 The North Wales Path runs just below here and there are also very nice waymarkers for the proposed Wales Coast Path in place now. 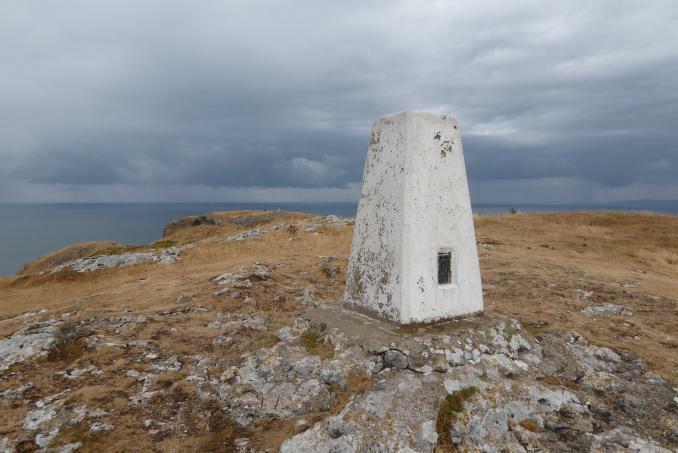 This would be an amazing long distance walk and I hope that plenty people take up the challenge. 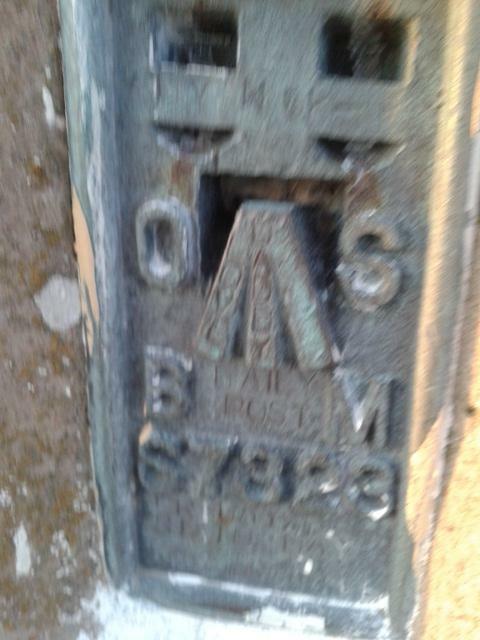 Did my 1,000th cache that day. Short walk from car park at pub. Nice location and views. Pillar good. 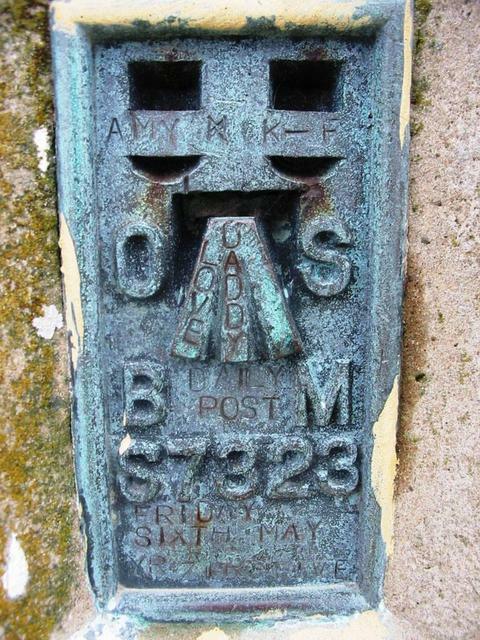 Filled plug and quite a lot of neatly scratched or punched lettering. Fantastic views all round. Creigiau Rhiwledyn, HuMP, parked in Premier Inn car park. GR8 views on a warm 20 degree C late September afternoon. 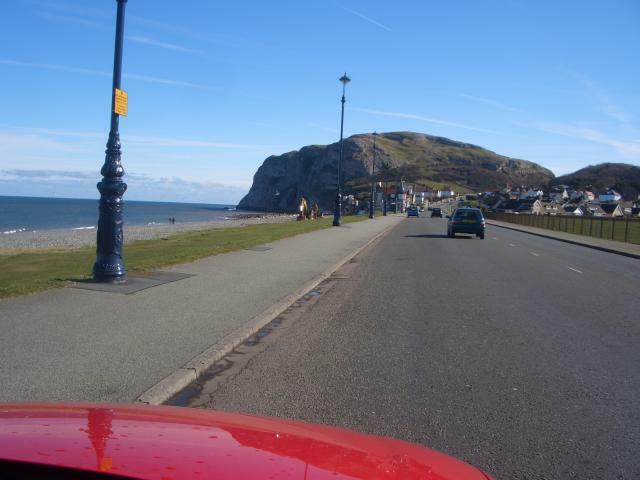 Parked near the Welcome to Llandudno sign and walked up from the main road through the nature trail. 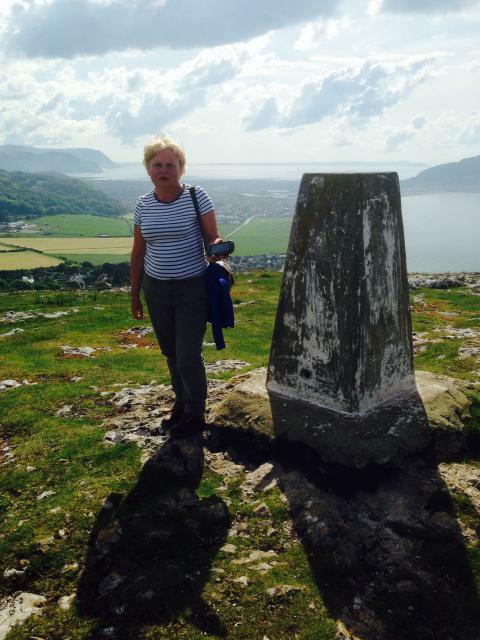 Short steep climb to the top but well worth it. 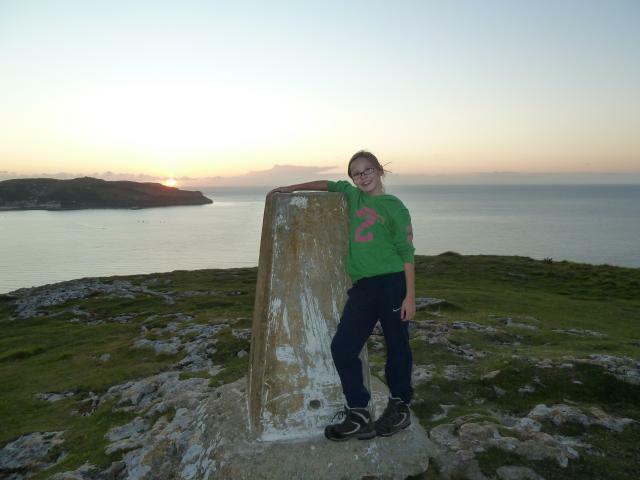 Another one with amazing views in all directions. 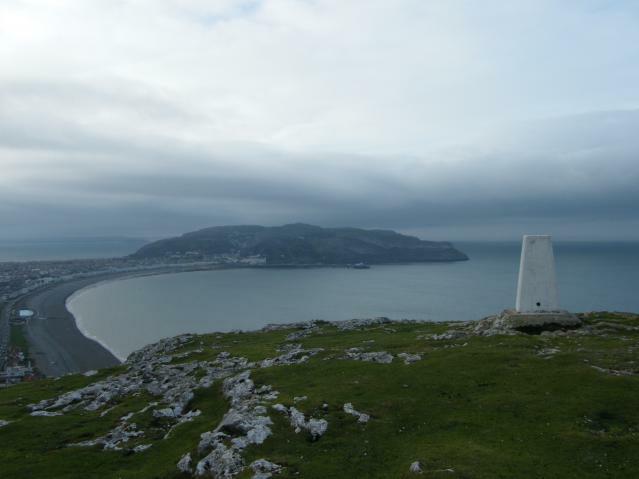 Nice walk up to Little Orme after bagging Great Orme earlier that day, bagged Bryn Euryn later that day. 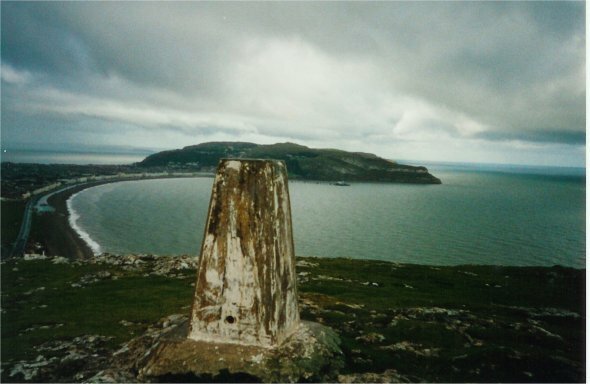 The pillar stands on the summit of a headland to the east of Llandudno. 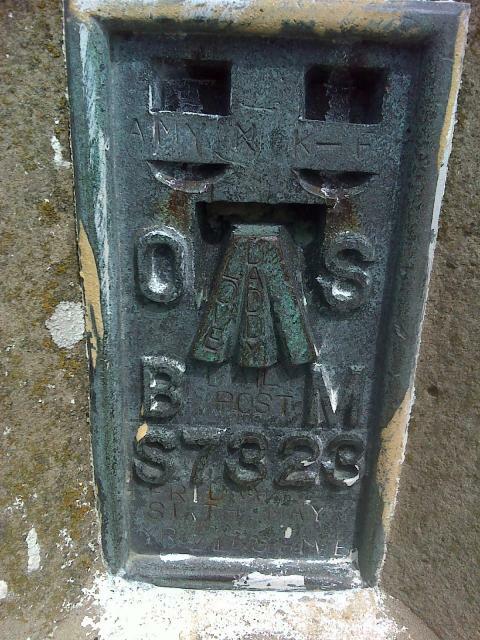 The trig has an asphalt plug and FB S7323. 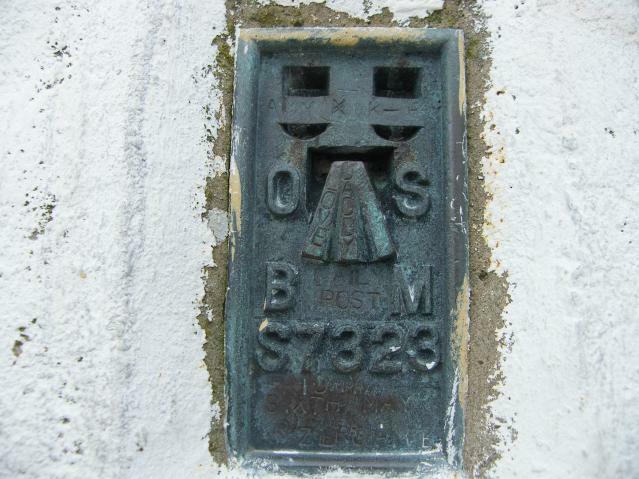 Its ironwork has various neatly scratched or stamped graffiti. 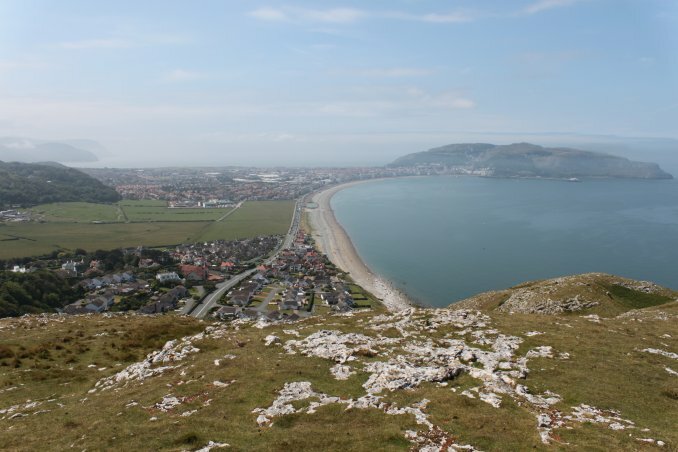 The headland was accessed from the end of the suburban street of Penrhyn Beach East. 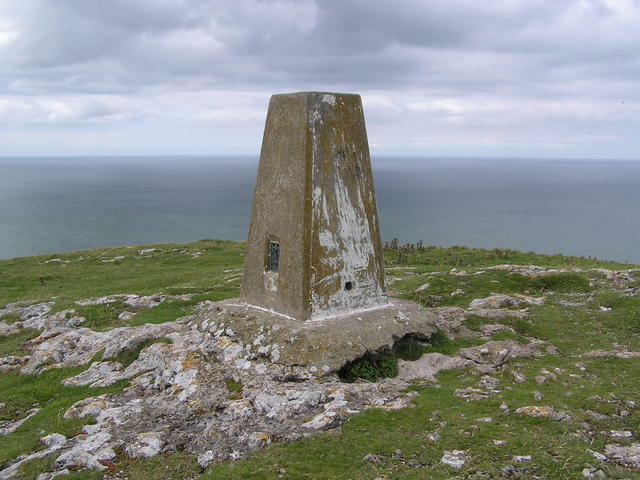 The trig was reached mostly by public paths. 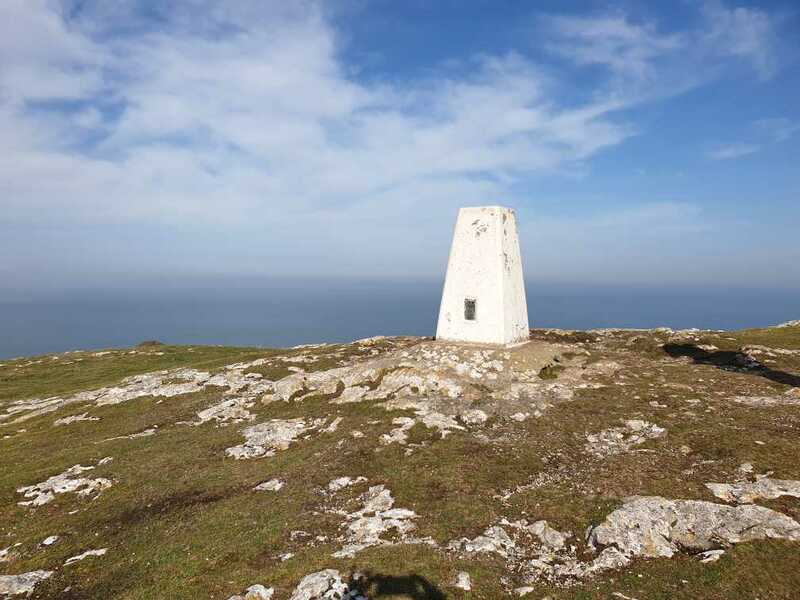 The summit has a fantastic view of the North Wales coast from Anglesey, Puffin Island and the Great Orme in the west to the distant resorts and the end of the Clwydian Range in the east. 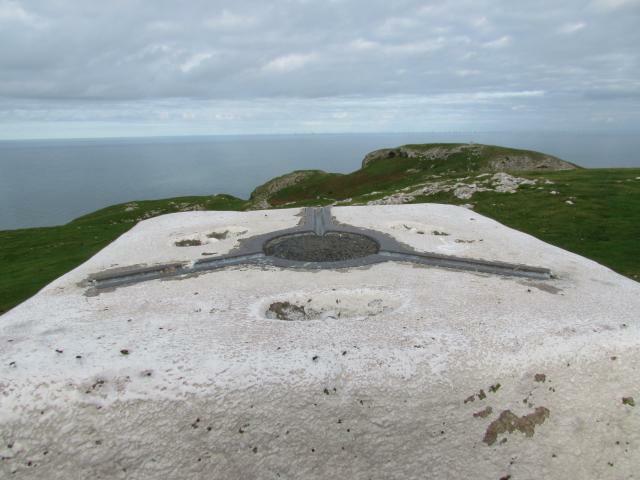 In the far distant the coast of Lancashire could just be discerned. 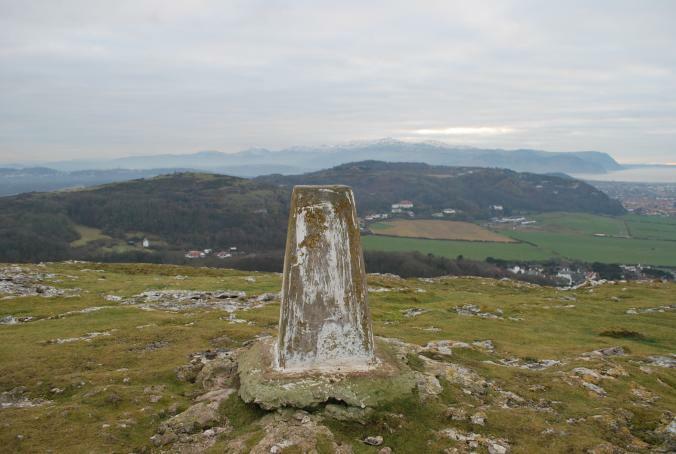 The peaks of Snowdonia could be seen to the south west and broad moorland hills to the south. 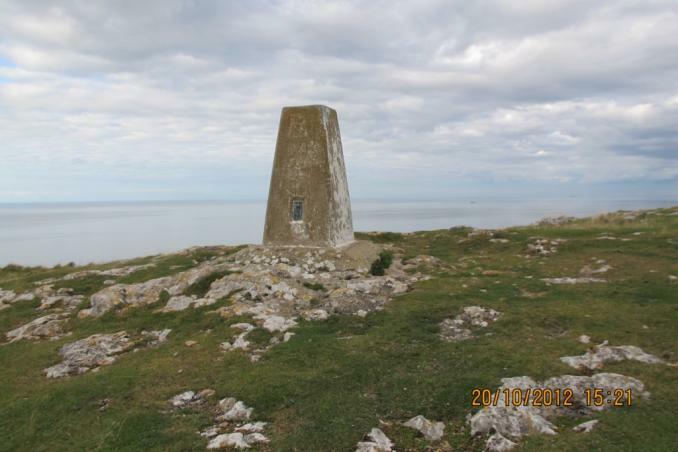 The Rhiwledyn Nature Reserve occupies part of the headland and the pillar is within the Creigiau Rhiwledyn/ Little Ormes Head SSSI. I was accompanied by bird song throughout my walk and I found the old quarry workings particularly impressive. Pleasant climb up. Parked at the Craigside Inn. 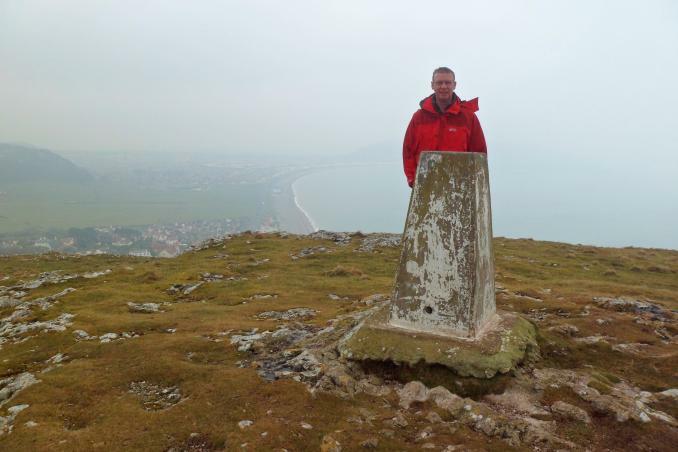 My 1st Welsh Trig Point !! Great views from here today. 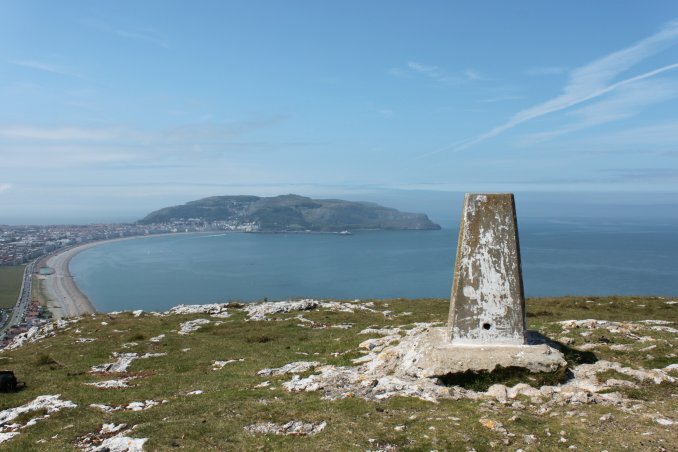 The views from here were better than from Great Orme. 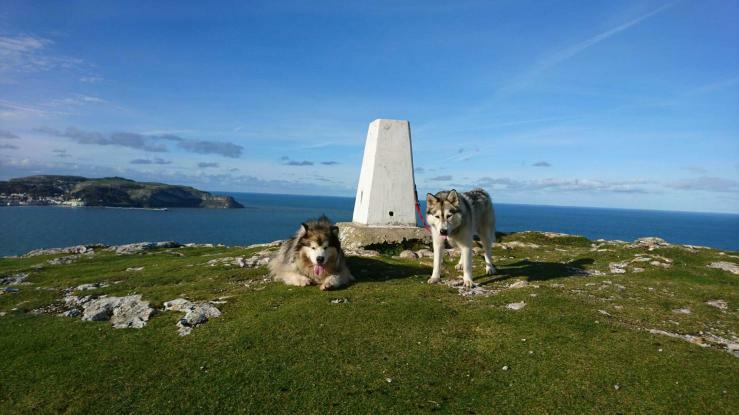 Excellent walk up to the top. 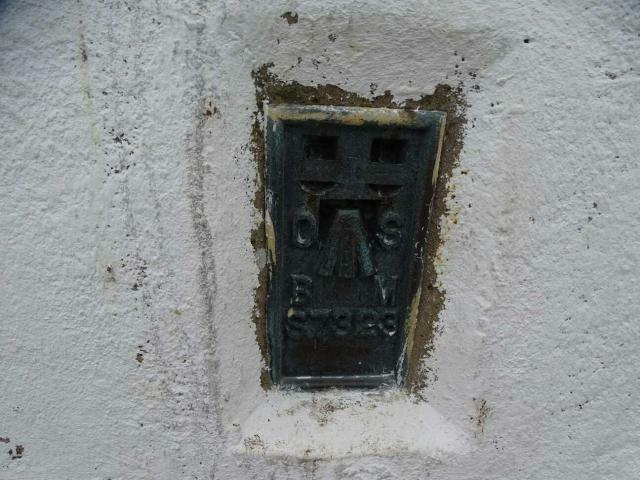 Asphalt plug. Public. 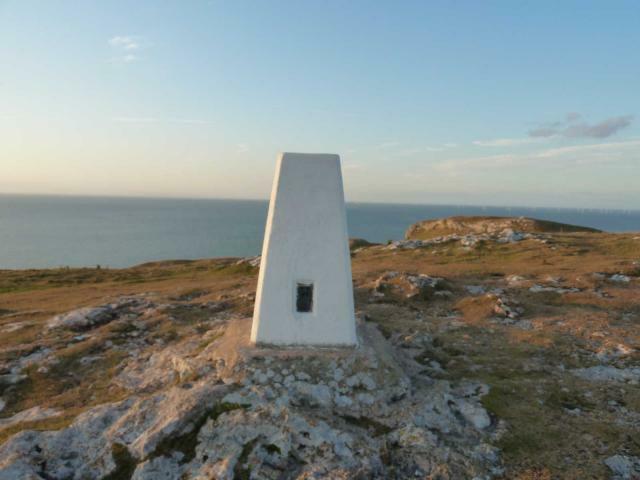 The Little Orme is not Access Land, but there is a public footpath from the North Wales Path up to the top of the headland & trig. 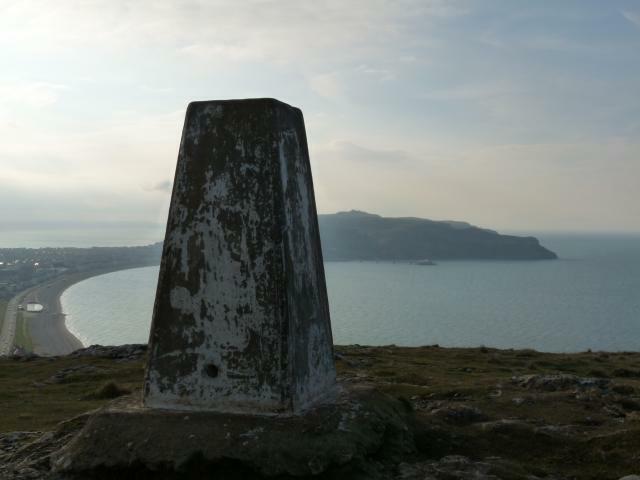 For safety reasons, keep to footpaths on the steep headland. 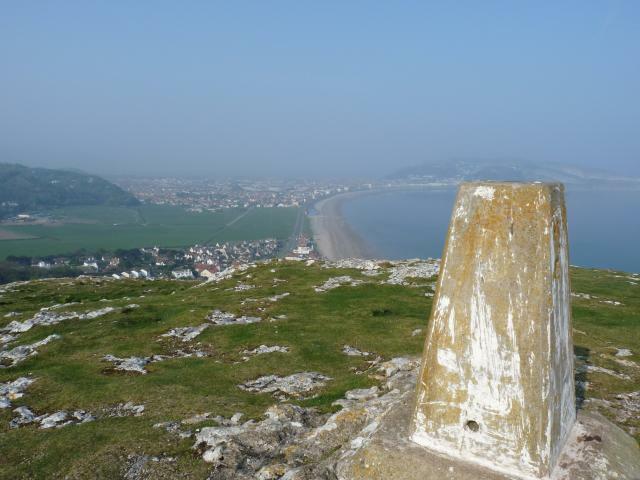 Taken in as part of walk along North Wales Path from Llandudno to Penrhyn Bay. 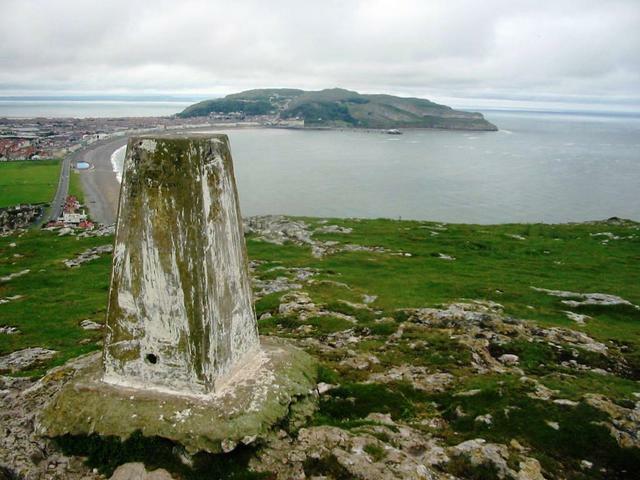 Trig stands above North Wales Wildlife Trust's Rhiwledyn Reserve & is clearly visible from Llandudno promenade. 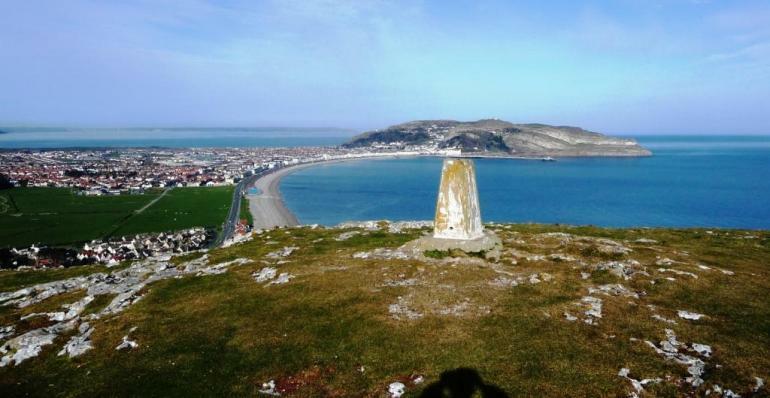 Good view of Llandudno and the Great Orme. 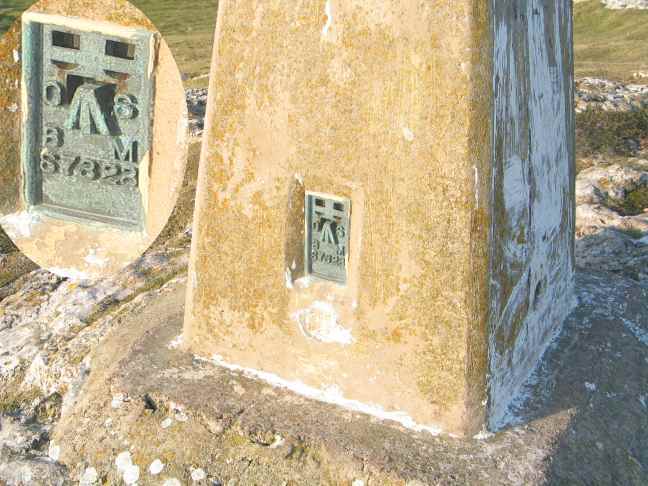 Funny white streaks of paint on the trig. 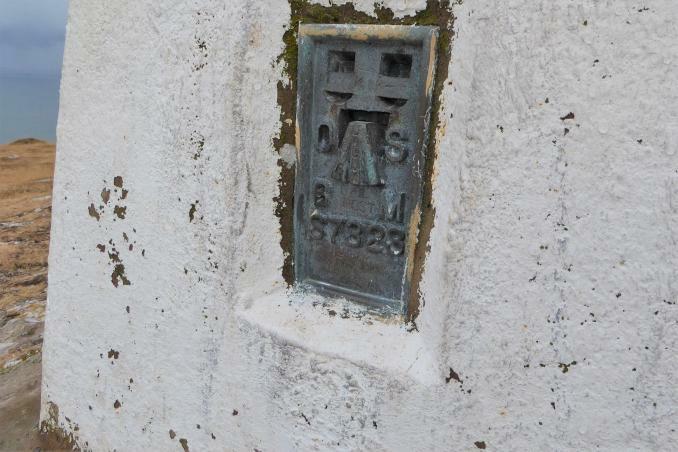 Did someone make an amateurish job of painting it and quickly give up or has it just worn off? 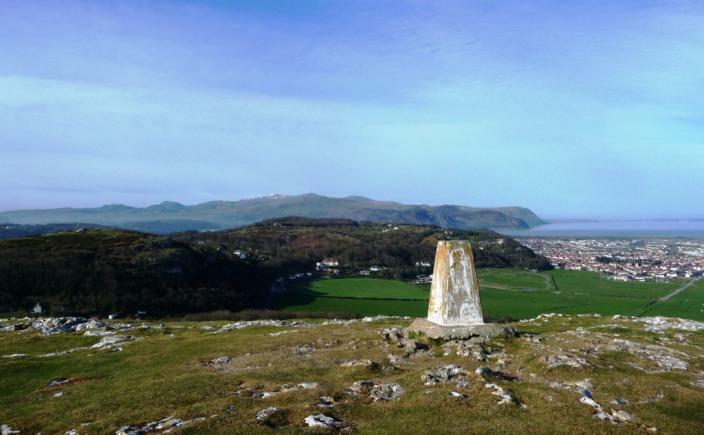 Accessed via footpath off B5115.Fairly stiff walk but rewarded with fantastic views. 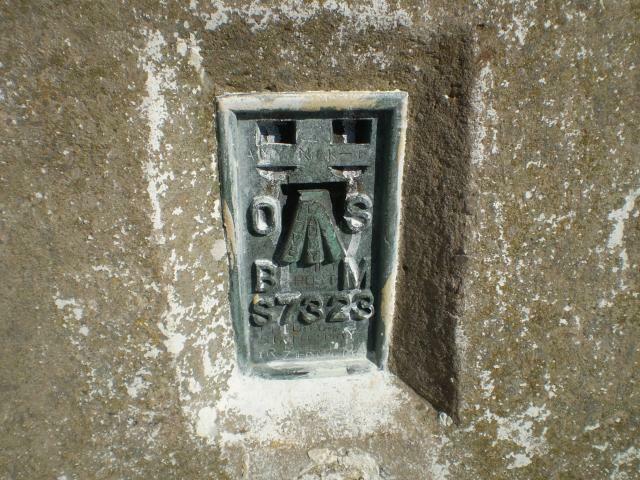 Access via a footpath, from main road via kissing gate. Steep climb up with some scrambles. 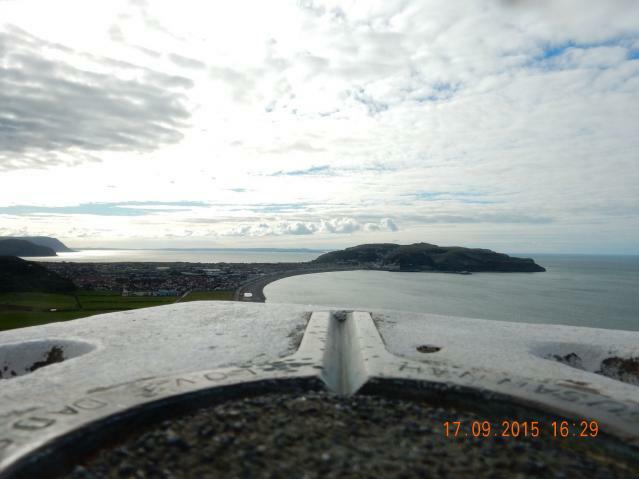 A fantastic view point from up here today. Bagged this one whilst doing the two nearby caches. 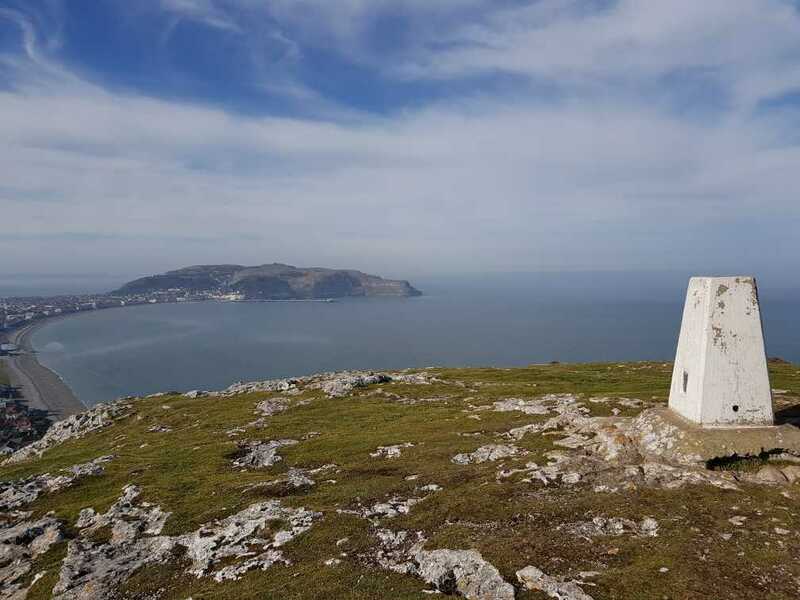 Great spot and views up on the Little Orme when we visited en-mass whilst caching and visiting the nearby event. Re-logging as originally found as Maxiboo22 but consolidating all finds under the one account. 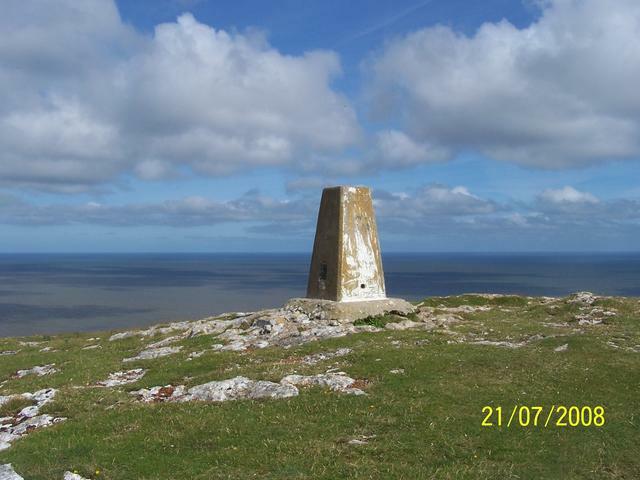 Trig in good condition, Good view over the bay. 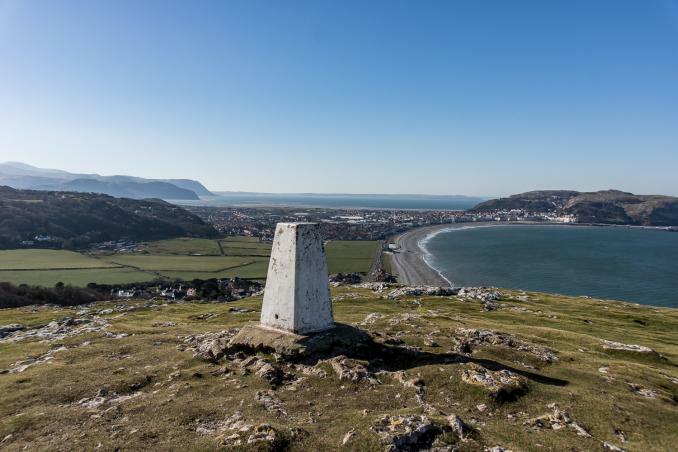 excellent view of Llandudno and peninsula. Walked up from the beach to the main road and then via footpath. 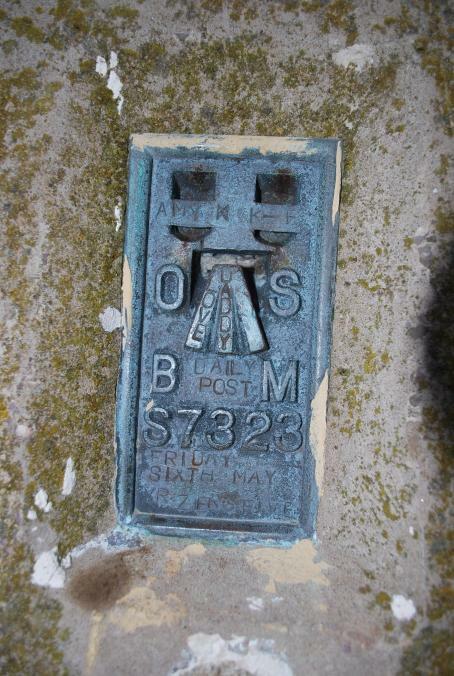 Surprised to see a dead Polecat on the pavement below Little Ormes Head.Good all round views.Number plate had some various stamp marks in the brass including DAILY POST! 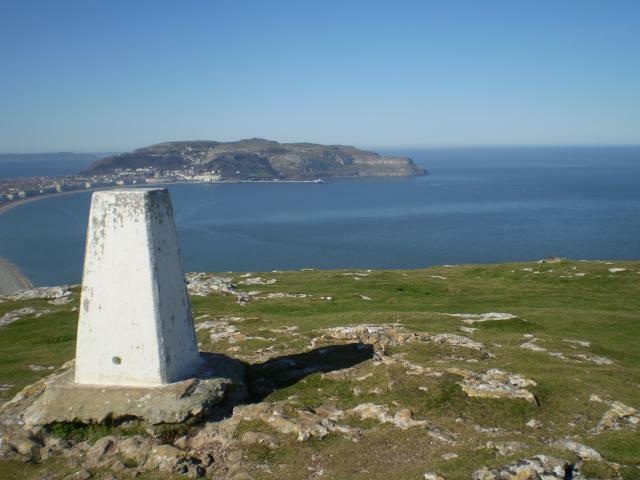 A glorious day for this short easy walk up the Little Orme. 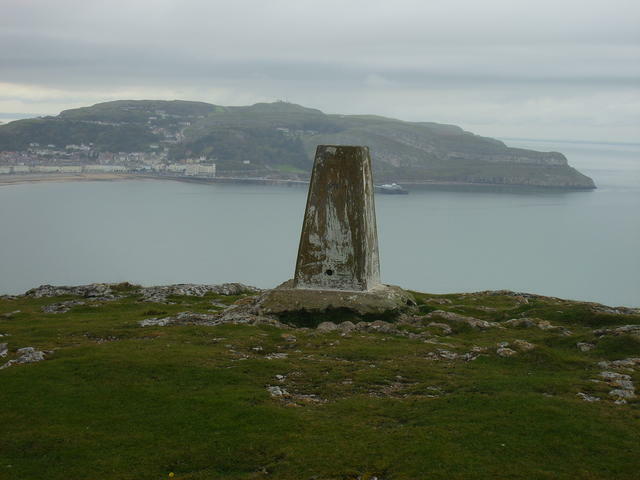 Spent a good hour at the top admiring the extensive views, before heading off to the Great Orme. 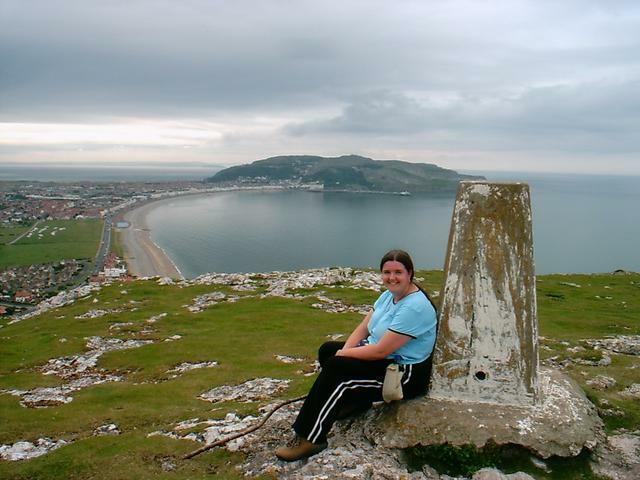 A hard climb up the path to the summit of Little Orme. 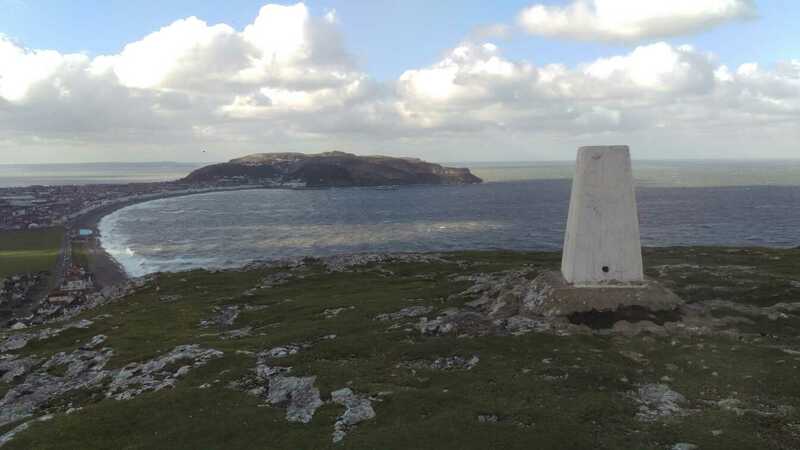 The pillar in vgc and some good views over Llandudno bay. 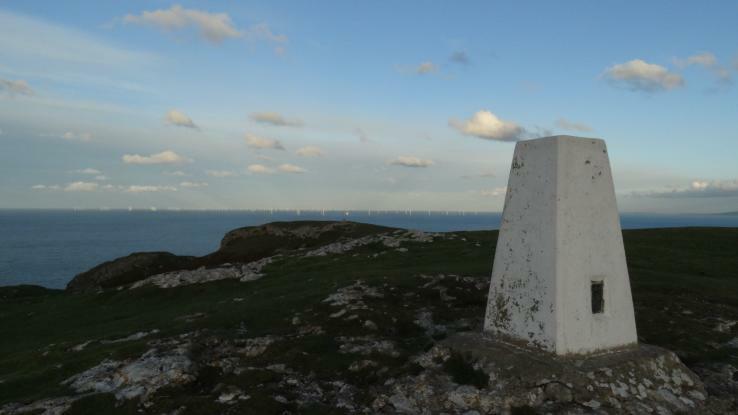 Lovely sunny day - great views of Llandudno and Great Ormes Head as well as the windfarm out in the sea at Prestatyn. Path up a bit overgrown with tall nettles some of the way. Pillar in good condition but has no paint remaining on it now. Interesting Location. Worth a visit as not far from parking! 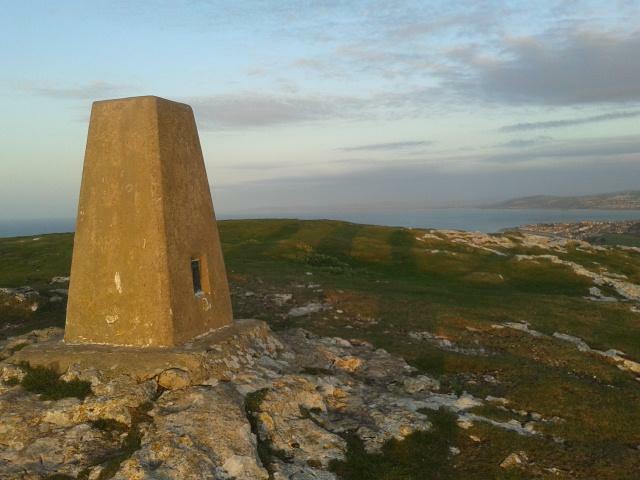 Little Ormes Trig looking to Great Orme A bit grubby! 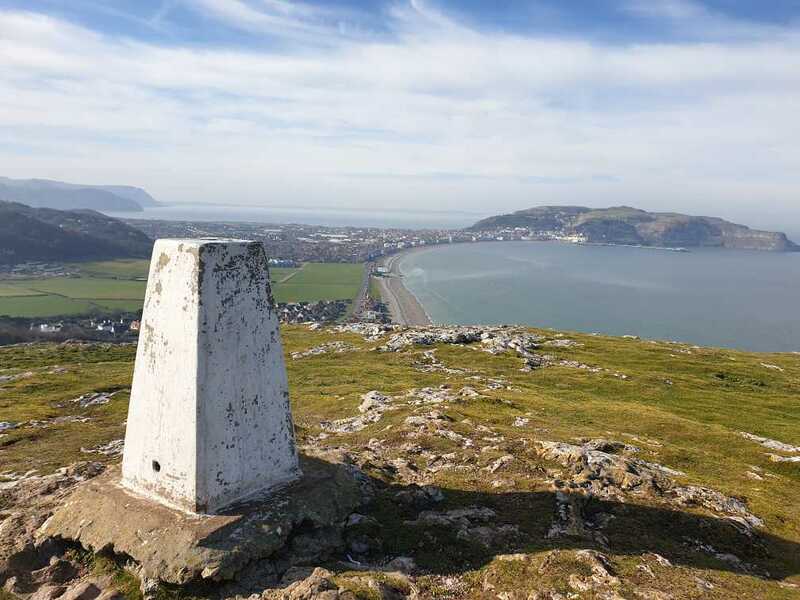 Superb views all round especially to W over Llandudno and towards Great Orme. Loged this whilst scouting out the first part of the multi on LOH, as i didn't have my GPSr with me i couldn't attempt it. 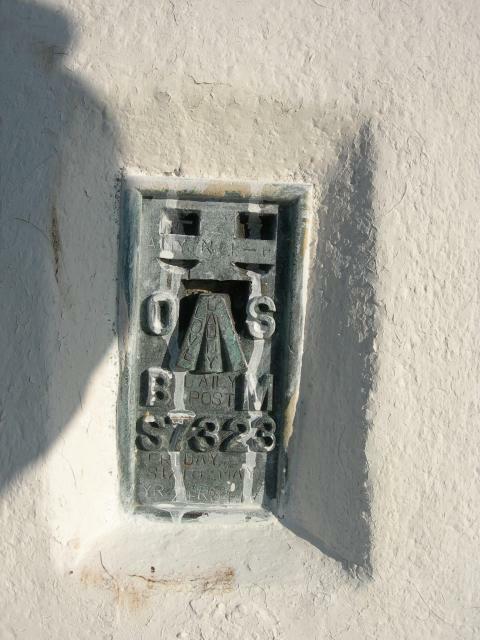 Found this as part of the multicache Pierview. Didn't note the FB number. Pretty hard slog getting up here! Hard work getting up here! 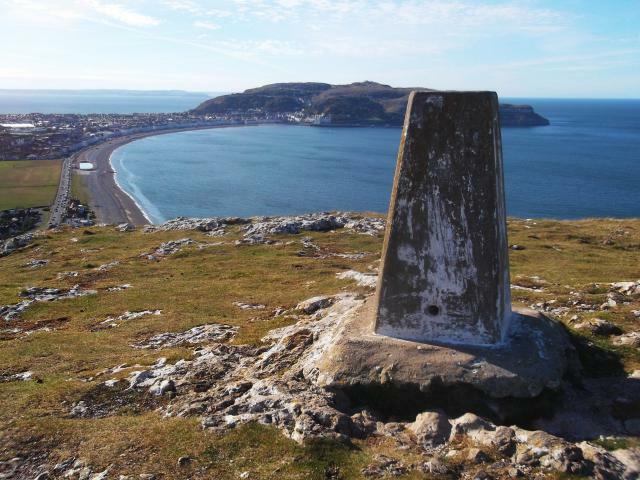 Good view of the Great Orme.